"That'll do Donkey, That'll do." "Shrek" squirts onto the screen like the first chew of a Starburst candy purchased at the theater confectionery. The colors, the visual jokes (an ogre's pond fart brings dead fish to the surface), the sweet animation and infectious charm of Myers and Murphy! But the humor is not only visual. 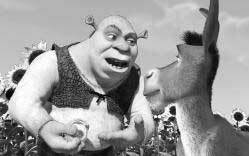 At one point, Donkey (Murphy) thinks Shrek (Myers) has fallen seriously ill, "Oh my God, He's going to die, keep your legs elevated, turn your head and cough!" And if that isn't adult enough for you... try, "Snow White lives with seven other men, but that doesn't mean she's easy." 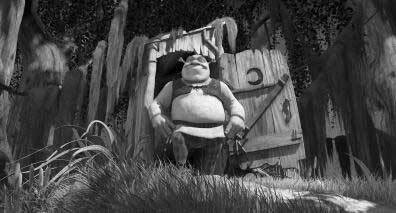 Still, what separates "Shrek" from the rest of the animated fairy tales is an acute poke-funnery of them. At every turn of the yellow brick road, "Shrek" spoofs. In a very early scene, villagers, for a couple of shillings reward, sell out fairy tale characters from Hansel and Gretel to the three blind mice. I just loved Geppetto's expression as he pockets the cash immediately after dumping Pinocchio with the captors. Disney, Disneyland, and especially classic Disney animated features take plenty of good-hearted ribbing. In one uncontrollably hilarious scene, the princess wakes up to sing with a bluebird, which explodes at her ridiculously high pitches. And then ... BAM, with only the climax left, the film does something inexplicably wrong. It becomes the fairy tale cliche it has heretofore been so irreverently mocking. Ouch, what a slap in the face. The next ten minutes play like dozens of other soapy, fairy-taley, over-used ploy-tactic complication to climax scripts. Needless to say, it's a very disappointing blemish to a fresh fruitatious smorgasbord of laughter. Fortunately, the actual climax ends the film on a strong upbeat. Besides the elimination of that aforementioned plot progression, I'd have had Shrek accidentally refer to the donkey as Eddie. Just to have it reply, "Mike! What are you doing? Don't call me that! I'm Donkey and you're Shrek!" But that would be just one more gut-busting moment in a movie full of them. Could have been an "A" or even "A+" without the fault. Shrek. Copyright © 2001. Rated PG. Starring the voices of Mike Myers, Eddie Murphy, Cameron Diaz, John Lithgow, Vincent Cassel. Directed by Andrew Adamson, Vicky Jenson. Written by Ted Elliot and Terry Rossio and Joe Stillman, and Roger S. H. Schulman. Based upon the book by William Steig. Produced by Aron Warner, John H. Williams, Jeffrey Katzenberg at Dreamworks/PDI.